← IHBC supports LPOC petition on VAT reductions for LBs: ‘…it is perverse that repairs should be subject to VAT when new development is not’. IHBC’s latest ‘Jobs etc.’ skills review: Specialist areas and skills in demand, from design and project management to regulation and more. To help profile career opportunities across the conservation and heritage sectors, the IHBC now offers regular reviews of job openings and staff appointments featured in our celebrated – and very cost-effective – ‘Jobs etc.’ service, with many posts still open today! ‘Integrated conservation and design skills sets loom large across recent demand, as in the posts at Islington, Charnwood, South Somerset (now closed) and Lambeth, while many also cover the more familiar public sector conservation adviser roles, such as those at Epping, Birmingham, Waverley and Lambeth’. ‘Clearly all these employers value both the reach of our ‘Jobs etc.’ network and the transparency it offers to their corporate processes. While of course self-evidently they also must recognise the great value of the Jobs etc. service and the unique benefits of IHBC-endorsed networks and skills’. 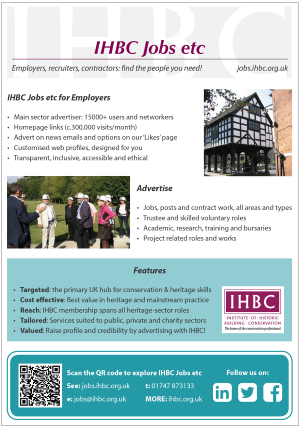 The IHBC Jobs etc service reaches a uniquely diverse heritage network of practitioners and advisers from different specialist backgrounds, including architects, planners, engineers, archaeologists, historians, builders, contractors, academics and many more! Circulation data feedback as standard. Remember: All IHBC members can opt in or out of the email alert service, and non-members are encouraged to sign up for free. So you don’t miss out on your perfect job, even if you are not a member, SIGN UP for the emails alerts.